Don’t see your question answered here? Please contact our Reservations Department and we would be happy to assist you 800-427-4124. Why would I want to ride the Wine Train for Dinner if I can't see anything? When you ride the Napa Valley Wine Train for dinner, part of your trip will be dark. How much of the trip depends on the time of year. A significant portion of your trip may take place during “Magic Hour,” the hour just before sunset when the entire valley glows. Mountains glow yellow, clouds glow pink, and young grape leaves glow a golden green color. Magic hour is truly magical, and Napa Valley is at its most beautiful and most romantic. And while the beauty of the scenery gradually fades after sunset, darkness has a way of making the train even more romantic and intimate. In December, it will be dark for the entire journey, but the Napa Valley Wine Train is a fun way to see some of the Valley’s holiday lights. If you plan to ride the Napa Valley Wine Train to see and experience as much of the Napa Valley as possible, join us for lunch, and consider reserving our Ambassador Winery Tour. If you are hoping for a more private experience or want to dress up, you’d love riding the Napa Valley Wine Train for dinner. Can I bring an animal on board the train? Per state law, animals are not allowed on board the Napa Valley Wine Train, with the exception of service animals. If you have a service animal, please see the next question. Can I bring my service animal onto the Napa Valley Wine Train? The Napa Valley Wine Train occasionally accommodates service animals on the Train. Please have the service animal’s certificate of service available for our conductor’s inspection prior to boarding. The motion of the train, and the unnatural, high-pitched metallic sounds that the Train makes as it goes over joints in the tracks may make some animals very uncomfortable. The entire Train is only about 8 feet across and a walkway runs through it. This means that service animals will always be within about 3 feet of a frequently used walkway. Animals not accustomed to heavy and frequent foot traffic may be very uncomfortable. Service animals must not sit or lay down in a walkway as this presents a hazard to other guests and the animal. Napa Valley Wine Train staff have been trained not to touch the service animal, but other customers may not understand the role of a service animal and may want to touch the service animal. The owner of the service animal must provide all of the care that the service animal requires. Any food or water which the animal requires, and appropriate containers for serving food and water to the animal, should be provided by the owner. Sanitary toilet arrangements must also be made by the owner of the animal, and, in the interest of the health and safety of our guests, the staff of the train will not handle or dispose of animal droppings or urine for the owner. The Napa Valley Wine Train urges all owners of service animals to carefully consider the points listed above before deciding to bring your service animal aboard the Napa Valley Wine Train. Is the Napa Valley Wine Train wheelchair accessible? It is a few hundred feet from the ADA accessible Parking spaces to the Front Desk. 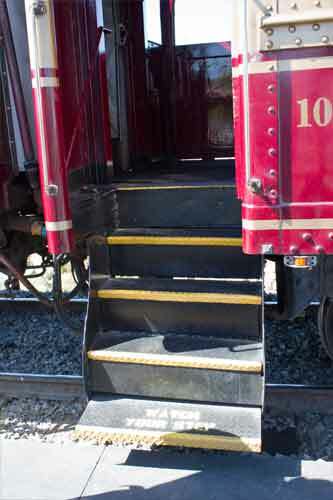 Boarding the train requires passengers to climb some rather steep stairs (photo of the stairs). The tallest of these steps is 9.5 inches tall. The steps are slightly recessed, which some guests may find challenging. There are both right and left handrails. Passengers unable to climb stairs may board the train via a manual lift (photo of manual lift #1)(photo of manual lift #2). 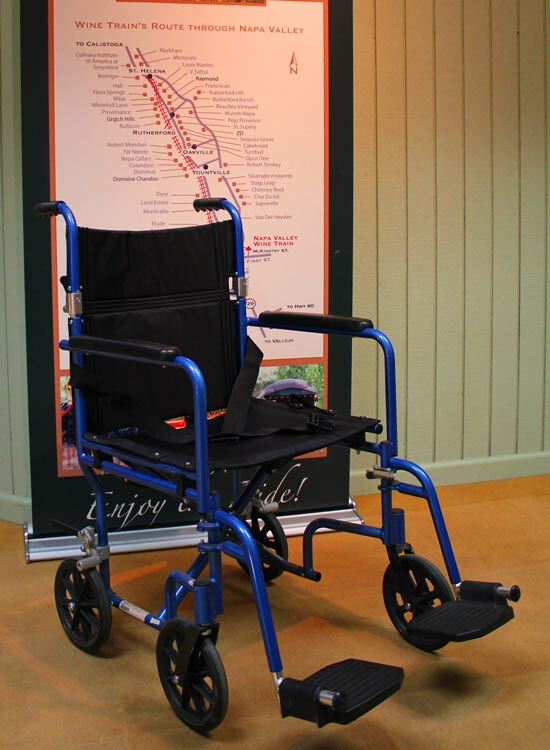 Because we cannot guarantee that personal wheelchairs will fit on the Train, if you require the assistance of a wheelchair, we strongly recommend that you use our transfer chair (photo of our transfer chair), since this is the only wheelchair that we are confident will fit in the train. The Gourmet Car is accessible with our transfer chair. There is no way to access the Vista Dome car without climbing stairs. Inside the Vista Dome car there are seven steps, each 8 inches tall. There is a handrail on the right side only. Moving in a wheelchair while the train is in motion is difficult, and guests who require a wheelchair should move only when advised to do so by our staff. If a guest with a mobility limitation wishes to move about the train, they must be assisted by a member of their party. At this time, we cannot accommodate guests with mobility preferences on any of our tours. The restrooms on board the train are not wheelchair accessible. You will need to be able to get out of your chair in order to use the restrooms. 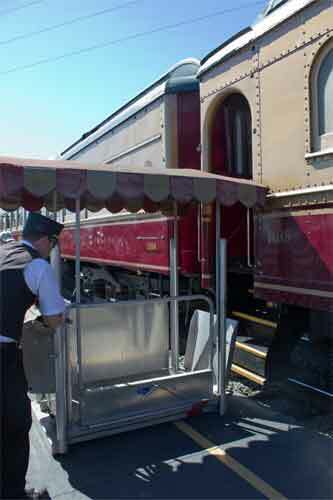 Despite the unique challenges presented by our historic train, many guests with mobility limitations ride the Napa Valley Wine Train. If you have specific needs or concerns, please contact us by phone at +1-800-427-4124. Do you really have a Kitchen Car and can we see it? At the Napa Valley Wine Train, we pride ourselves on the quality of our food. Executive Chef Donald Young buys only fresh, local produce, line-caught fish, and humanely raised meats. All of our entrees are prepared on board, and guests are more than welcome to observe our kitchen car in action. What does "Traditional Rail Seating" mean? In the spirit of traditional rail seating, you may share a table with another party on our Winery Tours, special events, and select packages during our lunch trains. Parties of four will always be seated at the same table. A limited number of private upgrades are available in the Gourmet Express Package, and all tables are private in the Vista Dome. Can we bring on our own wine? Yes, we recognize that many people have special wines they would like to have for their special occasion. The Napa Valley Wine Train charges a corkage fee of $20.00 per 750ml bottle and $30 for a magnum-sized bottle. If you bring one bottle of wine on board and buy a bottle on board, we’ll waive the corkage for the bottle brought on. At the Napa Valley Wine Train, we have a Wine Shop with almost 500 wines available for purchase and we have an extensive onboard wine list with approximately 40 wines. How long has the Napa Valley Wine Train been operating? The Napa Valley Wine Train began gourmet dining service September 16, 1989. The railroad itself, however, was built and operated by Samuel Brannan in 1864 as a tourist railroad to take visiting San Franciscans as they arrived by ferry in south Napa to his resort town Calistoga. 2014 marked the 25th Anniversary for the Napa Valley Wine Train and the 150th Anniversary for the rail corridor. Are the meals made by the Napa Valley Wine Train? The Gourmet Express, Vista Dome cars, the Vintage Rail Car 1052 and 1013 all have their own kitchen and specific menu. Award-winning Executive Chef Donald Young and his culinary staff do not cook each meal until it is ordered. Some of the side dishes and desserts are prepared in the Napa Valley Wine Train’s Culinary Arts Center and ‘finish’ cooked or baked on board during the three to six hour excursions. Even the sorbets are made by us! Every day, we serve a variety of guests with different dietary restrictions and food allergies. All of our menu choices are prepared fresh and made to order on board the Train, but some advance notice helps handle special menu requests. When making your reservation, please alert your booking agent of your needs. The agent will submit your information to our kitchen staff and to our onboard manager. And when you arrive, remind your server which member of your party has the allergy. Rest assured, we handle hundreds of allergies weekly with ease. You’re in good hands. Do you allow children aboard the Napa Valley Wine Train? Do you have children's rates? Children’s rates are only available for select packages. Please call +1-800-427-4124 if your party includes children age 12 or under in order to secure the children’s rate. We do not offer a children’s menu on board the train, however, we can adapt many of our menu items to suit your child’s tastes. Who owns the Napa Valley Wine Train? The Napa Valley Wine Train is owned by Noble House Hotels & Resorts, Ltd.—a collection of luxury hotels and resorts—and Brooks Street, a California-based real estate development and investment company. We encourage our guests to dress for the occasion, though we do not have an enforced dress code. Dinner can be dressier; some guests prefer cocktail party attire. Jackets are suggested on cool nights, but not required. It is always a good idea to bring an extra layer to make sure you are warm enough on board. Due to state regulations, smoking is not permitted in the Station, on board the Napa Valley Wine Train, or on the outside observation deck of the train. How many railcars are there? Find out more about our antique train and railcars here. Most Train tours and packages typically take three to six hours. Lunch and Dinner journey without a winery tour stop are typically 3 hours. 1/2 Day Winery Tour packages are 3 to 4 hours. Full Day Winery Tours are 5-6 hours. What payment methods do you honor? We can process AMEX, MasterCard, Visa, Diner’s Club, Carte Blanche, Discover, Novus, and JCB over the phone. Our online reservations system is capable of processing either Visa or MasterCard. Gift Certificate numbers must be provided at point of reservation as payment method and must be presented upon check-in to secure boarding passes. Are there bathrooms on the Napa Valley Wine Train? 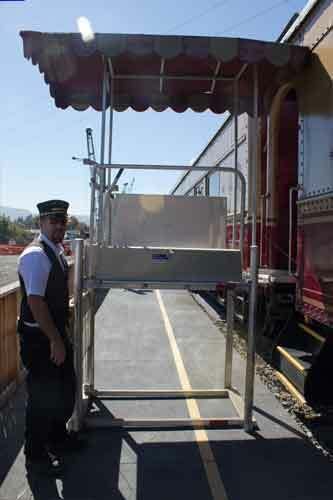 Most of the Napa Valley Wine Train’s rail cars are equipped with a restroom. Do you have to drink wine on the Napa Valley Wine Train? No, you do not have to drink wine on board the Napa Valley Wine Train. For our guests who do not want to drink wine, we also offer juice, soda, non-alcoholic wines, beers, cocktails and brandies. One glass of welcome house wine or bubbles is included with the Vista Dome package, the Estate Tour, Famiglia Tour, the Legacy Tour and the Collective Tour. Napa Valley Wine Train package for guests who are over the age of 21. Wines may be included during select special events. All our other packages or tours do not include welcome taste or glass of wine. Cocktails, specialty drinks, bottled waters, beers and wine can be purchased on board throughout your journey. More than 40 wines are on the wine list, including wine flights. Optional tipping is solely based upon guests’ experience on board. Tipping should be based on the meal price of $65-$81 and beverages purchased while on board the train. What does my package pricing include? Prices posted and charged for all food and beverage items served on the Napa Valley Wine Train include sales tax, which will be paid to the California State Board of Equalization. Gourmet Express: Train fare, a multiple course gourmet meal, and on-board coffee, tea, and pitcher water service. Vista Dome: Train fare, a multiple course gourmet meal, Vista Dome upgrade, (1) glass of sparkling wine, and on-board coffee, tea, and pitcher water service. Winery Tours: Train fare, a multiple course gourmet meal, welcome glass of bubbles (served only on Legacy, Collective, Estate and Famiglia tours), on-board coffee, tea, and pitcher water service, and one or more tours and tastings at the specified winery or wineries. Special Events: Train fare, a multiple course gourmet meal, on-board coffee, tea, and pitcher water service and event programs and features as specified in the event package details. Can we get off the Napa Valley Wine Train? Currently passengers can only disembark as a part of one of our winery tours or special events. Does the Napa Valley Wine Train stop at wineries? Currently the Napa Valley Wine Train offers multiple lunch and dinner Winery Tour packages which include winery tours and tasting experiences. See our “Our Tours” link for full details. What can I expect once I arrive at the Station? Your journey will begin in the Napa Valley Wine Train Station in Downtown Napa. After checking in at the Reception Desk, feel free to explore the Station. Visit our Wine Shop and discuss some of our rare, boutique wines with our knowledgeable wine educators. See the story of our founding on the TV monitors or just sit and relax with wine, coffee, or friends. Thirty minutes before boarding the lunch train, our wine specialists will give an introductory lecture on the Napa Valley and the Napa Valley Wine Train. The arrival of the Napa Valley Wine Train will be announced one half hour before the scheduled departure. Please wait for your seating section to be called. It takes quite a while to board an antique train, so don’t feel the need to rush. We won’t leave without you. What time are your reservation agents available by phone? Our Reservations Department phone lines are open from 7:00 a.m.–12 midnight daily and can be reached by calling 800-427-4124.